The EURUSD re-tested the .500 Fib of its rise from Apr 3, and snapped back into its falling wedge and the (purple) channel that's guided prices since then. The e-minis tacked on a few points overnight -- almost reaching the .786, only to give them all back with this morning's underwhelming Durable Goods report. The Head & Shoulders Pattern that was looking pretty good at yesterday's open is now looking a little iffy, with a right shoulder that's already 15 points higher than the left. After plunging beneath the channel that's guided it from 1343 to 1597 on Apr 17, SPX rallied and re-joined the channel yesterday. This was a very bullish development, as long as SPX remained in the channel all the way to the closing bell. It now sits perched on the neckline of an Inverted H&S Pattern which has either completed or not, depending on whether a 5-minute plunge qualifies as a shoulder. Short answer -- I have no clue. As long as prices remain in a rising (or falling) channel, we can expect prices to continue to rise (or fall.) It's rather simplistic, but it usually works. We can make educated guesses as to future price targets based on where the channels point. Of course, even well-formed channels (multiple tags on the top and bottom and over a sufficient time period) can't go on forever. I look for moments when prices must choose whether to remain in or leave the channel. A tag of a top or bottom bound or midline usually create opportunities, though other lines can as well. Recall that we shorted SPX at the 1597 high on the 11th [see: Big Picture], riding down to the channel bottom where I went long at 1554, expecting at least a bounce. We got one on the 16th with SPX rallying up to 1575 -- the channel .25 line. We closed our long position, going short the following morning for the trip back to the channel bottom at 1555. We tried another long position there, but were quickly stopped out as the channel was broken -- signalling a bearish trend change. At that point, I expected a back-test of the broken channel. We got it, reaching 1565 on the 22nd but closing beneath the channel's lower bound. Note that this move completed 5/6 of a H&S, but the right shoulder was underdeveloped relative to the left. Anticipating an intra-day retracement to 1567 (the .500 Fib) or 1574 (the .618) the next day (yesterday), I stayed long -- trying without much success to anticipate the top. 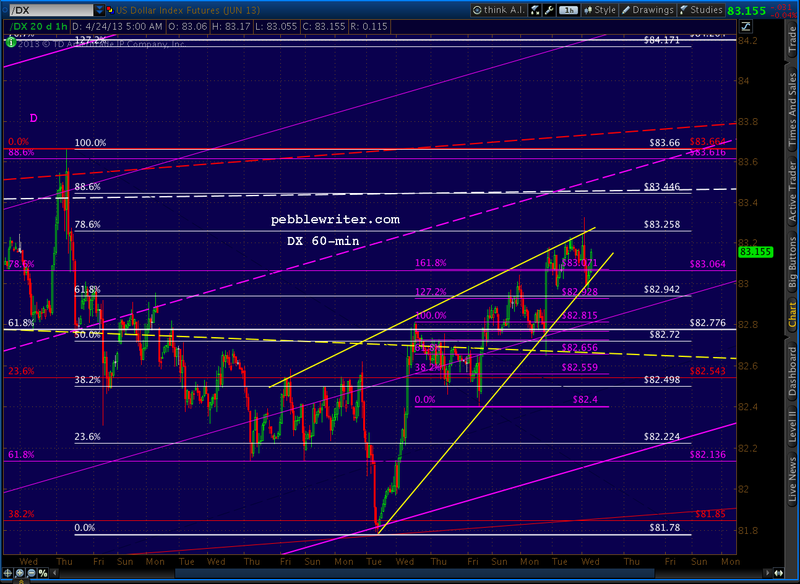 Since SPX topped the .618, the next up on the chart is today's target: the .786 at 1584.23. With all that as preamble, here's what I expect going forward.